Miss Berry expresses her desire to see Miss Wheeler and explains the great need of a gymnasium for the boys during the winter. They already have $5,000 and need to raise another $10,000. Miss Berry hopes Miss Wheeler receives the letter at a time when she can help with the gymnasium. 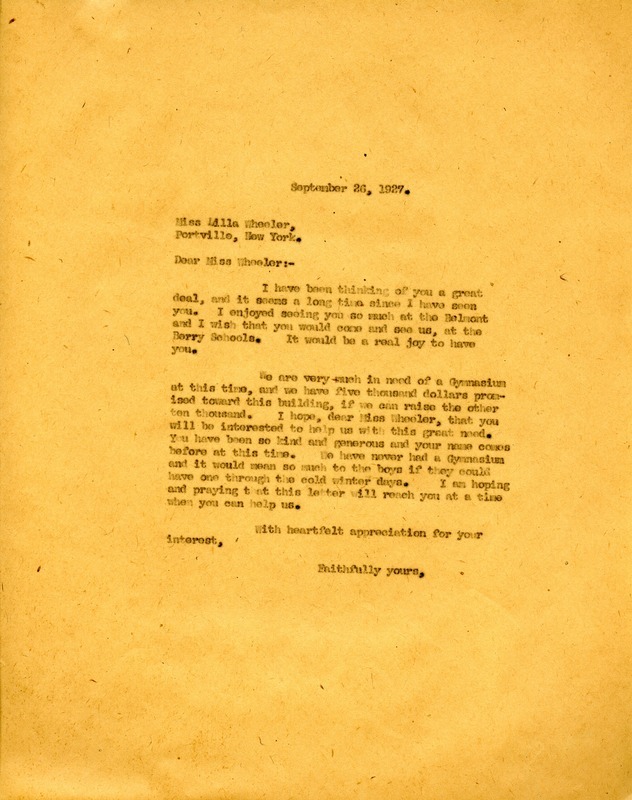 Miss Martha Berry, “Letter to Lilla Wheeler from Martha Berry.” Martha Berry Digital Archive. Eds. Schlitz, Stephanie A., Rachel Renaud, Chelsea Risley, et al. Mount Berry: Berry College, 2012. accessed April 18, 2019, https://mbda.berry.edu/items/show/6202.